When I first got the car I thought I would be able to repair some of the brake pipes and make up the bits I needed. The fact that the silly person who had it before was a bit handy with a hacksaw turned out to be a real issue and still is going forward. I hunted around the net looking for something that would do the job, a swaging tool and flaring tool all in one. Marvelous I thought, so I purchased this tool from new as it was a bargain. What I didn’t realise was at the time that it would not be a good idea to mix copper and the original steel together. That was the swaging side out of the window, and then I found out that brake pipe connections should be a double flare for strength, this tool is a single flare only. So that was the flare side out of the window, waste of money? Not exactly as it will have its uses and I have kept it in case. I have had a few searches land on my site looking for swaging tool and how to use it, so I have decided to review my tool as it’s snowing, freezing and I can’t use the filler properly in this weather. So welcome to the review. Well, it’s a nice sturdy blow moulded case where everything fits snug and is held in place well, two plastic snap shut catches holds it all together in place. Inside there are two bars, that are capable of holding both metric and imperial sizes. First bar has 16 & 19mm + 1/4, 3/16 & 3/8. 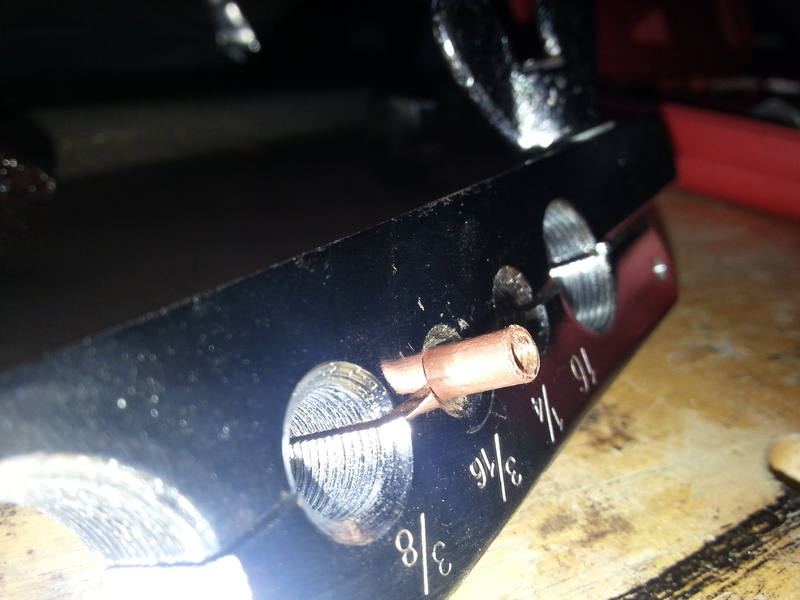 The second bar has 6, 8, 10, 12mm + 1/2 & 5/8. I suspect that the strange mixture is down to the fitting of the openings on the bars. 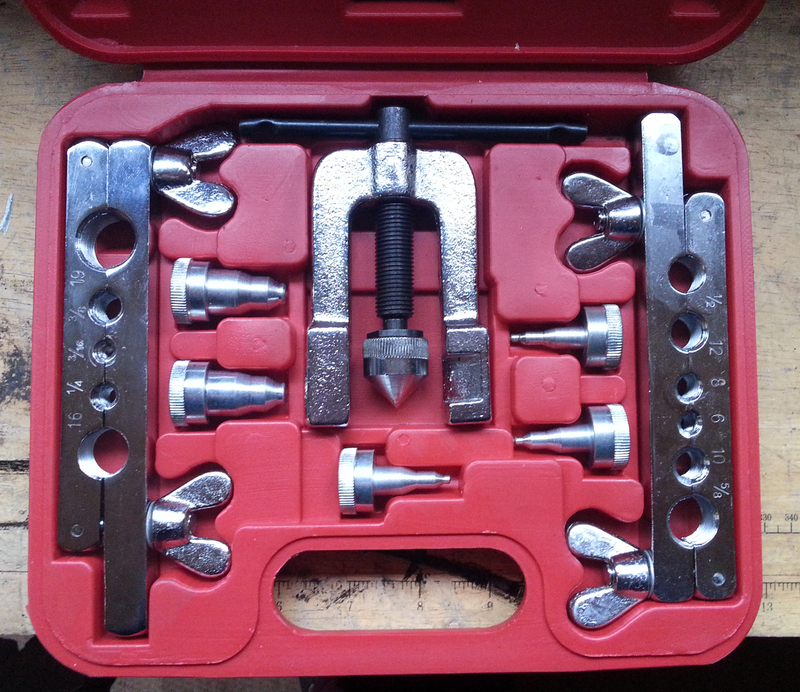 Also in the box is the press, and the five swaging die. Considering that there are eleven openings and five die how does it work? It’s a clever design as each of the dies has a double swaging tip. They work by selecting the size you want for the size pipe and opening you need. The larger of the swaging dies are further up the die in order to allow the smaller ones in first. The clamp, press or forming tool (what ever you decide to call it), has a removable tip that is by default the flaring die. This has a reverse thread to make sure it does not come undone during use. There were no instructions and I had to figure this out all by little ol’ self. The construction is of a heavy cast metal, the press is finished n a sort of anodised silver coating that is not fnished to well. The bars seem to be of a higher quality being in a polished chrome, the jaws on the inside where nice and sharp enough to hold the pipe firmly in place. The die seem to be finished well enough and nicely machined. I do suspect that the daily commercial use the tool wont last a life time. As with all these things perhaps a professional Snap-On set would be better. For for what I need it will do me just fine as it will for most weekend mechanics. The process I describe may not be 100% accurate but it works for me, and produces perfectly acceptable results. The major difference from the Blue Point TF5A tool is that the die on that tool will roll over the ends to give a double thickness on the flare and is a two part process to make it more secure. I have attached the Blue Point die just for a comparison. That particular process is called double flaring. I am also going to assume that you are putting the retaining nut onto the pipe in the correct place BEFORE you start the forming of the flare or the swaging connection. Also make sure that you can create these joints safely and are acceptable where you want to put them. This is a similar process I used for the Blue Point (BP) tool I have, (review here or look under the tools review section.) As this tool does not have a measure on how far the pipe should extend beyond the forming part of the bar it’s a little hit and miss. I do have an advantage as I remember roughly the height from the BP TF5A tool. Anyway once the pipe is roughly in place, you tighten the bar up and make some minor adjustments to the height before fully tightening up. Note: Although the bar faces are machined to match up, there is movement in the bar wing nuts. 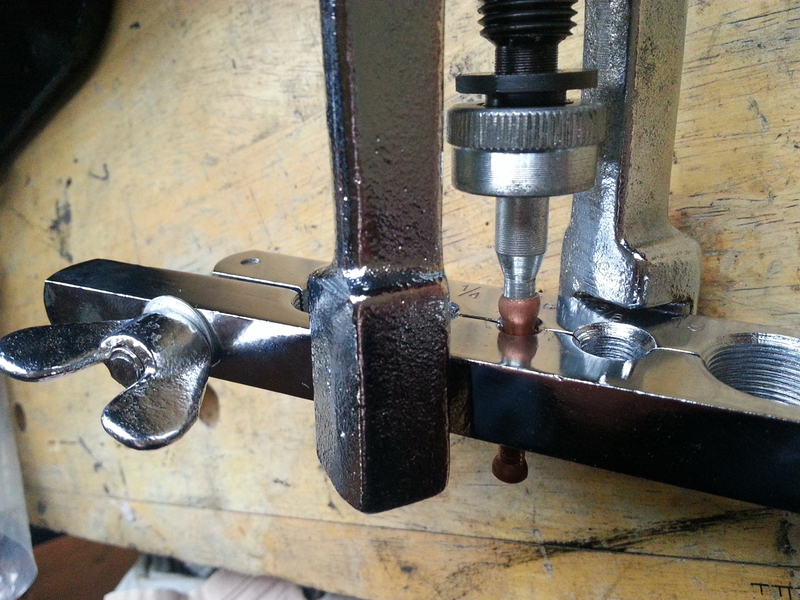 Make sure when tightening the bar up fully that the forming part of the bar casts line up properly. Place the press onto the bar and twist a few degrees until the cut outs of the press sit either side of the bar. Now you can wind the press down until the flare die is just resting on the top of the pipe. Make sure the die is sitting square, when you are happy that it is, begin to wind down the press and start the form of the flare. The ideal height of the pipe should be enough to allow the material to be splayed out into the forming pat of the bar, to little and the retaining nut may not have enough material to bite on and cause a failure of the joint. To much and you will have an odd-shaped flare that may not fit into place properly. Once you have wound down fully undo the press and remove. You should now have a nice funnel shape flare in the bar. Undo the sides of the bar and remove. Job done. OK, that was the easy bit, this section requires a few practice attempts and I would suggest that you do just that before you start on the pipe you intend to fit and don’t balls it up as a result. (Consider yourself warned). For this you will need to remove the flaring part of the press and change it over with the swaging die. Once the swaging part of the die is in place on the press you can start the positioning of the pipe. The size of the join is dependant on the pipe I guess, I imagine that if you have to much of it, the pipe will just crumple down as you try to expand it. Also the pipe needs a sufficient amount to make the join properly. Open the bar and place a length of the pipe above the bar that you need to make the formation of the join. Attach the press in the same way as the flaring to. As I am using he 3/16 sized pipe this is the bottom of the die this will need to be wound down again just touching he top of the pipe. Making sure this is again square you can slowly apply the pressure. I found slow constant pressure to be the best technique, applying rapid force caused the pipe to bend over, hardly ideal when trying to insert another piece of pipe into it. Continue to wind down the die into the pipe until it hits the top of the bar and the flaring part of the tool, this creates a nice step for the other pipe to fit into. Undo the press and undo the bar and remove the pipe. I have noticed that as you are trying to expand a pipe that doesn’t normally want to be expanded in such a way, the square end does tend to come out a little uneven. IF you’re picky then a little filing will make the ends square again. Job done. The single flare of this tool and the swaging die is a little hit and miss to start with, the reason being there is no guide for the size of pipe that needs to be exposed to the die. For that reason this tool requires a little practice and guess-work before you obtain the results you want. Saying that it works, not for what I wanted on my brake lines that are under a load, but for fuel lines or for water lines it will be ideal. The fact that once the swaging is done there will need to be a degree of soldering or pipe joining to make the swaging join a good sound fit. I am not a plumber and that sort of detail can be found on the net to finish the job properly. The fact that there was no guide or book of words causes me to mark it down. BUT, that is a little unfair as it does do the job efficiently. When it comes to the larger diameter pipes I suspect that the limited size of the t-bar may need a little helping hand to apply the full pressure. The quality of the press part of the tool was not great and showed signs of uneven coating. Considering the price I paid for it and the fact that it does work I gave it the score I did. If I had paid four times the price I expect I would have sent it back for a replacement. The eBay company got negative feedback for sending me out their unchecked stock. They didn’t like that, but tough.